Treat a grand piano like an enormous piece of visual art when decorating the living room, but factor in tuning and care. A grand piano in your personal salon is the glorious "elephant in the room" It commands all the attention, so you might as well go with that and [decorate the living room around it](http://wwwlushomecom/living-room-design-ideas-spacious-room-decorating-grand-piano/47259). In a too-small space with a too-big piano addiction, less is more. 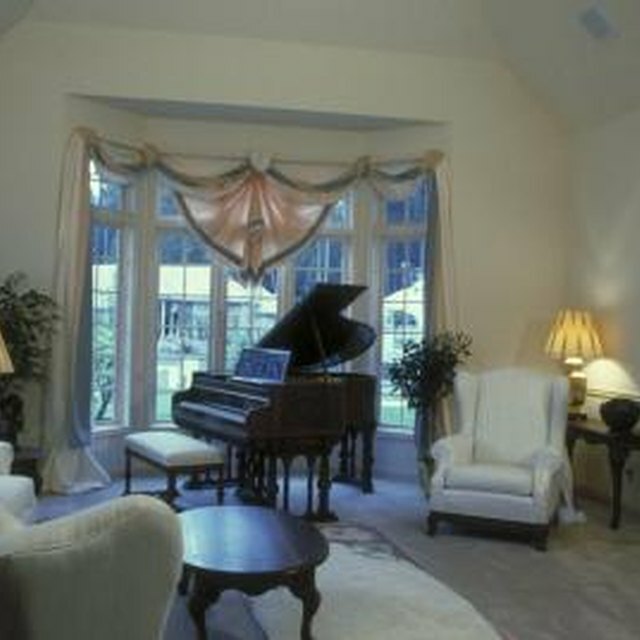 In a cavernous great room there are natural nooks that accommodate even a concert-size Steinway, Yamaha or Bosendorfer. That massive musical instrument is actually a delicate flower. You paid a lot of money for a quality grand piano, and that piano will appreciate with age if it is properly cared for. Proper care is enhanced by the piano's location in the room, which, in turn, dictates the area left for other furnishings. **Humidity** is critical to piano maintenance -- to its soundness as well as its sound. Avoid parking the piano next to a **drafty door** or **window**, next to or on top of an HVAC vent -- especially a **heating vent --** too close to a radiator or a working **fireplace**, or in **direct strong sunlight**. The wood, strings, felts and other materials are calibrated to precise and extreme tension, and its wood expands and contracts in various temperatures and humidities. Ambient conditions in the piano's environment cause changes that can quickly send a piano out of tune and eventually damage the wood, the finish, the tuning and the mechanics. Bay Window or Bad Idea? A bay window seems tailor-made for showing off that showpiece -- with the added advantage of clearing the traffic flow in the living room. But windows allow **sunlight** to hit the finish, which can fade or develop cracks or peeling. Sunlight may heat the piano and dry it out, very threatening conditions to piano longevity. **Drafts** let in winter's chill or the bath-house humidity of torrential downpours and rainy days. Do put the grand piano in the bay window but only when the **windows** themselves are **weather-sealed** Sun-deflecting and light-diffusing **curtains** and **sheers** control the amount of sunlight and should be adjusted throughout the day. **Large potted plants** -- opulent ferns, tall palms and bamboo -- add valuable **humidity** and increase the shade. Green plants also look terrific with a piano's gorgeous wood. The piano tuner may be a frequent visitor to your bay window baby grand. A large piano is your **focal point**, so begin with that. **Neutral colors** in the room highlight the gleaming ebony or natural wood finish -- the finish is part of the tuning and tone calibration, so it is created for beauty _and_ beautiful sound. **How the piano opens** is a major point -- the lid should open toward the seating in the room for optimum sound and visual balance. The rest of the seating should be open to the piano; it's an attention-grabber, particularly if it is being played, and no one should have to crane their neck or twist around to enjoy it. Follow the curves. Grand pianos are wonderfully sinuous, and a **round ottoman** or a couple of comfortable stools can tuck into the long curve along its open side. The modern piano was invented in the 18th century and, despite some rather fancy and embellished palace cases, has always kept its spare, classic lines. **Simple classic furnishings** complement a grand piano shape, producing two kinds of harmony in the living room. In an **odd-shaped room**, the far end of the piano will tuck into an angled corner, exposing the wide keyboard to the rest of the room and utilizing space efficiently. If a room is small and the piano dominates the entry view, position the instrument so the first thing you encounter is its **narrower closed end** to minimize the visual impact and make the room seem bigger. Give the piano some like company; placement **in front of a library wall** provides a worthy backdrop to the Beethoven and the boogie, and the books will dampen some of the sound vibrations if you have a neighbor problem. A thick **flat-weave carpet** and padding -- orientals are very compatible with pianos -- help to muffle the brighter notes as well, although that does run counter to enjoying the large, rich sound of a grand.